Cleveland Golf is an independently operated subsidiary of Japan-based SRI Sports. The brand rose to prominence when used by Vijay Singh on the tour circuit from the late 1990s. Since then, Cleveland Golf has emerged as a major brand. The Cleveland CG Black Hybrid was launched in 2015. It is a game-improving hybrid that increases the launch angle and distance of the ball for golfers who don’t swing like the professionals and so can’t hit the ball as far. The CG Black hybrid is offered in more lofts than ever before, to ensure that golfers can gap themselves properly with the opportunity to maximise their play on the fairways. 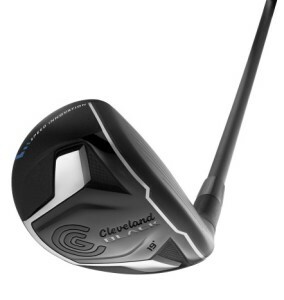 So ditch your long irons for the Cleveland CG Black hybrid. Expect reliably high, straight shots that the wind won’t touch. It will rescue you from rough spots by digging out your ball and getting it flying in the right direction. This hybrid is matt black. It has a simple, plain look of a golf club. The blue and silver colours are on the sole of the head with a slender blue line on the crown. It’s a sleek, clean-looking and stealthy golf club. The only downside is that there is no alignment aid on the club. The Y-Shape Sound Rib gives a pleasant sound with higher frequencies. A controlled explosion at impact, the CG Black delivers excellent, slightly head-heavy balance that puts you in charge. The club is easy to hit and the adjustable head helps you shape your shots for a draw or fade. The CG Black hybrid makes use of the lower-swing moment of inertia (MOI) to swing faster without swinging harder. You’ll swing like a pro. The lower centre of gravity (CG) which is moved closer to the club face, heightens the launch angle with a lower spin. The engineering changes to the MOI and CG ensure longer carry distance for seniors and women. The club is also very forgiving on mis-hits. You will get yourself out of difficult situations when needed thanks to the Variable Face Technology feature, which is an advanced face thickness to reduce the carry loss on off-centre hits. The increased head speed is translated to the ball across the face, which differs by up to 1.8mm from the thicker centre of the club to the thinner perimeters. This allows the ball speed to be maintained wherever the face impact position is. If you like to bend the ball, this hybrid may not suit you since the flight can be just high and straight. Get Cleveland CG Black Now!